Measure 20-272 asks voters to approve a new $0.35 local option levy to replace the existing $0.25 levy which expires July 1, 2018. Why does the district need the additional $0.10? Fern Ridge Library District has been operating with the same tax rate since 2004. This increase will allow the library to continue to provide service to Fern Ridge at our current level while absorbing the always increasing costs associated with public service as well as the specific increase created when the minimum wage increases were passed by the state legislature. What happens if this measure does not pass? We will try again with another measure in the fall. Our permanent tax rate only covers about 60% of our current budget needs. A local-option levy is vital if we are to continue to grow to meet the educational and recreational needs of the district. What if I have questions about the levy or the library budget? 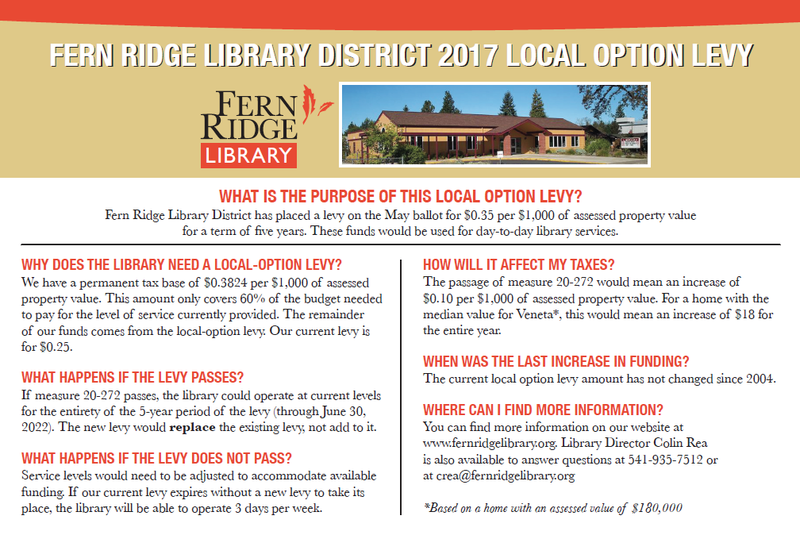 The Fern Ridge Library board of directors unanimously voted during their January, 2017 meeting to place a local-option levy on the ballot asking voters for 35 cents per $1000 assessed property value. You can see the notice of measure here. 1. Fern Ridge Library District is a special taxing district. We do not receive any funds from the city of Veneta nor from the state of Oregon. We are not a branch of the Eugene Public Library. 2. We have a permanent tax rate of 39 cents per $1000 of assessed property value. That amount will never disappear as long as we are a district. 3. Because 39 cents/$1000 is not enough to operate the library within the standards set by the Oregon Library Association, we place additional local-option levies before the voting population of our district. 4. We are currently in year 4 of a 5 year levy. This levy adds 25 cents/$1000 to your property taxes. 5. We anticipate that there will be no need to further reduce hours or material budgets in this year or in the fifth and final year of the levy. 6. Our current levy provides funds through June 30, 2018. As the results show, this levy asking for 50 cents per $1000 did not pass. Therefore, our current 25 cents per $1000 levy is still in effect, and will remain in place until June 30, 2018. If a new levy passes in 2017, it will take the place of our existing levy.